After riding 2 seasons in District 38 Desert I thought it would be impossible to get noticed by any pro type teams. That changed when Tracey Dickson came out on the 3 wheeling magazine project 200x. I was the top 200cc rider in D-38 at the time. Now I could see how I really stacked up. It was the king of the desert race, 100 miler. Tracey and I swapped the lead a few times but he eventually beat me by 30 seconds. A couple weeks later I called Tracey and introduced myself as the guy on the suspended 185s that he had done battle with. I invited him to do a team race with me. He declined due to prior engagements. 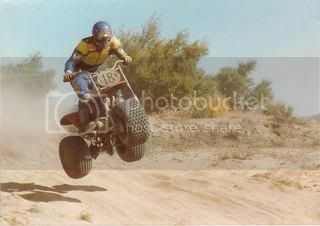 Then, to my astonishment, he invited me to team with him on the 3 wheeling mag 200x in the San Felipi 250. I got my chance. Dean Kirsten set me up a deal with oneal gear. We tested a couple times on the x so I could get a feel for it. It was prerun time…I had no idea what to expect. It was an eye opener to say the least. Just Tracey and I went down, with Nick Nicholson’s xr 400 to prerun with. The bike was a roach and I hadn’t been on 2 wheels since my motocross days in 1976; got my first ATC 90 in ’77. Anyway, Tracey turned me loose at Mike’s Sky Ranch Road. Not knowing Mexico at all, I trusted Tracey would be waiting 70 miles later. As I climbed the mountain to Mike’s it started raining. No big deal, until I threw the chain. I checked, and it seemed tight enough. I put it back on the road 10 more miles. Threw it again. Okay I’ll tighten it. I threw that chain every 8-10 miles. Muddy, cold, greasy welcome to Mexico. I think we bummed a new chain to finish the prerun. Then I got to see El Chinero the last 30 miles to the finish. I figured they gave me this short section because I was a rookie. Come to find out, Tracey said he would rather ride 90 miles over the summit so he didn’t have to ride El Chinero. This section paralleled the Sea of Cortez, all cross grain sand whoops. 30 miles of those bastards. Anyone that ever rode em knows, no rest till you reach the pavement at the zoo. Tracey also neglected to tell me every mile or two there was a dirt road leading to beach homes. I found out the hard way when I jumped out of a wash and there was an old timer in a pickup on one of those roads. I grabbed all the front brake available, pulled off a sweet stoppy, front tire never hit the truck but I went over the bars into the truck bed full of trash, chicken wire, and God knows what else. The old man got out and kinda looked at me like “what are you doing in my truck.” Obviously he thought I was trying to steal some house garbage. He rattled off some espanol. I didn’t have a clue what he was saying, except for the gringo and loco part. I got out of the truck bed to inspect the bike. The only thing that happened was that the bars got laid back during my stoppy maneuver. The truck had 2 dings where the bars hit. I lifted the bars, apologized to the old guy and got on my way. When I met up with Tracey, I told him what happened. He said, “Oh yeah, you gotta watch out for roads in there.” Thanks ol buddy. As race day approached, I realized a lot was riding on our effort. We had a team depending on us not to wad the bike up. There was Dean Kirsten, Tim Orchard, and Bob Dickson. They were chasing and doing pits. Bob was AJ Foyt’s crew chief in the 60’s. The pits and rider changes were his deal. We practiced changing riders due to our dump cans filling the x in 6-8 seconds. We had to be quick getting on and off. Then it was race day. Tracey did the 1st leg 50 miles, as the x came in running 2nd to wax and sparks. I would have never imagined this race would turn into 27 pro races for me. I got on and headed up San Mateas Pass. It’s amazing how a 4 stroke motor can run off that many butterflies. Mike’s Sky Ranch Road was a section of wide graded twisting mountain road, probably my favorite of all sections I’ve ever ridden. But 30 miles in was Mike’s Sky Ranch. That year lots of rain had swollen the stream to 30’ wide and 2-2.5’ deep. Not a problem when you’re just out riding for fun. Not wanting to take a chance my 1st big race, I would walk it across. Dean Kirsten had set it up with a pit team called Exlax out of El Centro to aid me if I needed it. At the stream crossing, my mistake was to let those fools help me. When I approached, I shut the bike off, and rolled to the edge of the water. They threw me a rope, okay I’ll tie it on just in case I slip or do something walking it across. I was on the downstream side of the x after tying on the rope. I wanted to be on the upstream side. Water was moving fairly fast. As I moved around the back, these guys yanked the rope flipping the bike 5’ into the stream. They must have been drunk already, it was 9:00 am. I get the x back on 3, untie the rope, and walk it across. Two kicks, it fires. No harm, thank God For small favors, the rest of that section went off smooth. Got it to Tracey still a close second. 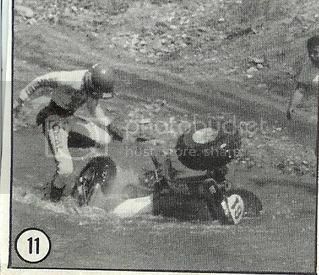 While waiting for Tracey to arrive at El Chinero, Dean and Tim Orchard informed me the skid pan was gone when we changed riders after Mike Sky Ranch. That skid pan was Tim’s OMF pan, it was his baby. Tracey came in; our choreographed rider change went off without a hitch except Tim didn’t get the memo how Tracey’s left leg flew over the back and my right leg flew over the back. The back was no place for one’s head, exactly the place Tim put his looking at the skid pan mounts. I knew as I swung my leg over, it hit something. I figured I kicked the fender or something, not, it was Tim’s skull. 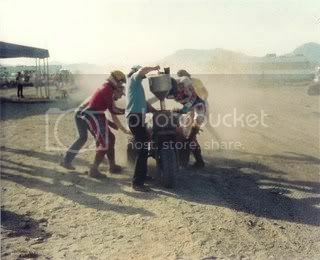 From what Dean said after the race, I toe kicked Tim mid-skull above the left ear. Damn near put him to sleep. Tim was pissed. He still didn’t know what happened to his skidpan. Anyway, the El Chinero ride went well. We finished 3rd overall out of 19 3-wheelers. We were 2nd 200 behind wax and sparks. We were all pumped. No crashes, no flats in a 7 hour race. Tim was also relieved his skidpan wasn’t the problem. The mounts sheared off the swing arm, easily remedied by Bob and Tracey.I will never be able to thank Dean Kirsten and Tracey Dickson enough,for taking A chance on a hillbilly like me.I did teach those guys you could chew copenhagen with A full face helmet and keep the mess to a minimum. My life was changed forever that day all because of 1 phone call I had made. Awesome story!! This stuff is gold! damn man thats sick!!! im stuck in long island new york where there is no where to ride unless you go upstate new york but still even up there no body famous would see me hahha you lucked out man congrads!! !